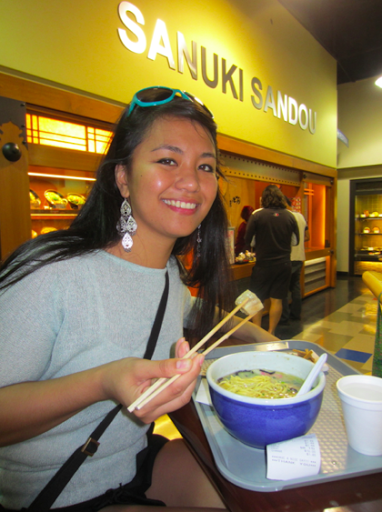 Last Friday, I went on a ramen run at a little place called Santouka. It is located in the food court of Mitsuwa Marketplace, on the corner of Centinela and Venice, along with other noodle shops. Funny thing is, I have been here years ago and had ramen at the exact same place. 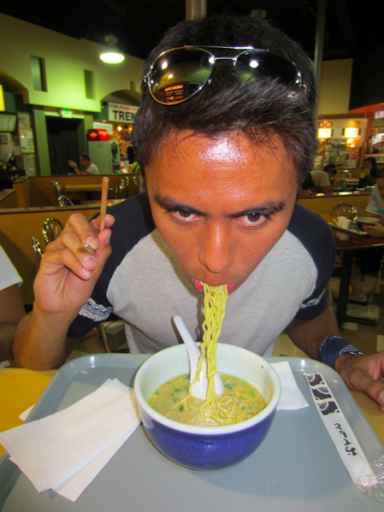 But at that time, I wasn’t very “experienced” with ramen and didn’t like the salt ramen that I ordered. Don’t worry, I wasn’t hung over. But ramen sounded really good that day. Miso ramen. It had bamboo. Bleh. This place behind me also served ramen, but the menu wasn’t that appealing. 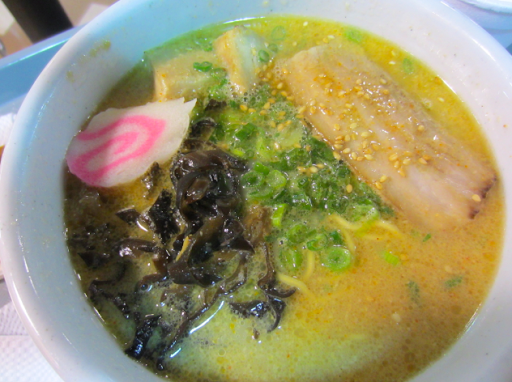 Mark also had miso ramen. Luckily he likes bamboo so I gave mine to him. 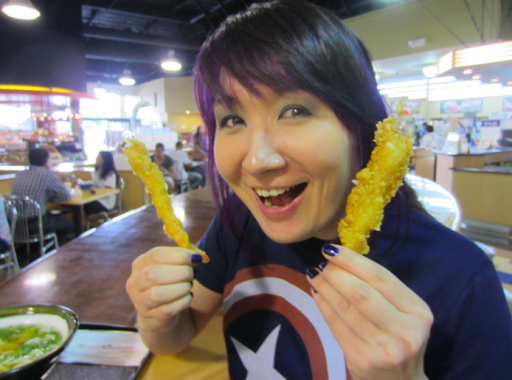 Showing off her tempura udon. Tanya decided to rival us that day and went on an udon uprise. For food court ramen, it wasn’t too bad. My only complaint was that it was pretty salty. It probably had MSG but funny thing was I didn’t swell up. But the broth itself tasted good, I could really taste the miso flavor. The noodles were okay, the texture of the noodles kind of reminded me of Top Ramen’s noodles. The pork slices were very flavorful and tender though. Santouka is one of the few places I’ve been that has kamaboko as a topping so that was a nice surprise. The shredded seaweed gave it a nice touch by adding a different texture and flavor. I’m starting to enjoy miso ramens so I might venture into the miso broths. Might. I just love tonkatsu! Overall, I think the ramen here was worth trying. If I’m in the area, hungover and craving ramen, I’ll definitely stop by Santouka. Well thanks for reading. Whoever is out there reading this. And I’m really sorry for taking so long to update. It’s been a while since I’ve actually written the blog after the run, but you know, things get in the way. But I’m glad that we’ve been going on more ramen runs. That way, we can blog more often to keep our fans interested. Hehe. Please “like” our facebook page for more updates! See you next time!